*Our most popular screen material commonly used in all forms of residential and commercial construction. Our product goes through many stringent tests to provide our customers with a very high grade product that is anti corrosive, burn resistant, has strong tensile strength, and has a very long service life. We offer a wide array of colors and sizes to fit most specifications. Standard and custom packaging is available for all of our screen products. *Commonly called “Sunshade or Sunscreen”, this material has a very high UV protection to help with the suns harmful rays. The thicker diameter fiber mixed with a tighter weave does an excellent job of shading the intended area. The product is very pliable making it very user friendly for both installers and the end user. 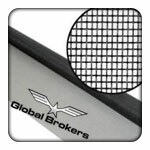 As our other screen material it is available in a wide array of colors and sizes. *If you are in need of a heavier then standard fabric our “Heavy Duty” mesh is for you. We are seeing many of our customers using the product for Pool and Patio screening as well as Pet Screening. The thicker diameter fiber and tighter mesh pattern does a great job of spanning large areas and providing excellent tear protection from animals. We offer this in black and gray as well as an array of sizes.